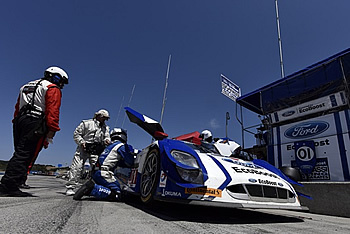 MONTEREY, Calif. (May 4, 2015) – Chip Ganassi Racing with Felix Sabates (CGRFS) with drivers Scott Pruett and Joey Hand finished seventh in the Prototype class in the Continental Tire Monterey Grand Prix Powered by Mazda at Mazda Raceway Laguna Seca in Monterey, Calif.
Pruett started the No. 01 Ford EcoBoost Riley in the second position for the opening stint of the two-hour and 40-minute sprint race. As the nine-car Prototype class navigated through the first corner of the 2.238-mile long track, first-lap contact with the No. 10 Prototype damaged a dive plane on the No. 01 car. Despite a lengthy pit stop to change the nose of the car and a driver change under a full-course yellow, Hand was able to steadily move up through the field until the team suffered an issue with the gearbox. The No. 01 Ford EcoBoost Riley team made repairs allowing Hand to return to the race and run consistent lap times. However, Hand was never able to recover fully from the nine-lap deficit resulting in the seventh place Prototype class finish. The next TUDOR United SportsCar Championship race will be the Chevrolet Sports Car Classic Presented by the Metro Detroit Chevy Dealers at the Raceway at Belle Isle Park in Detroit, MI on May 30. This race marked the fourth consecutive race that the No. 01 Ford EcoBoost Riley has finished in the top-10 in the Prototype class.